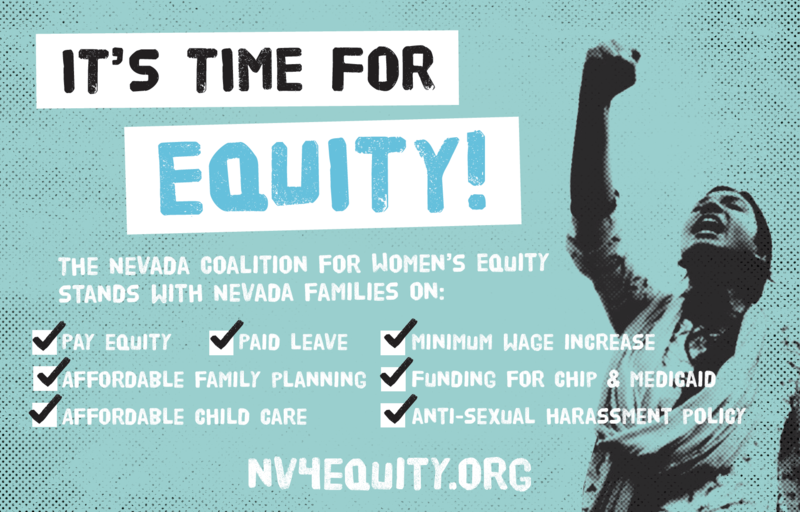 During the 2019 legislative session, the Nevada Coalition for Women’s Equity will be supporting legislation that promotes gender equity, strengthens the health and well-being of Nevadans, improves our workforce, and creates an environment more favorable to women and working families. Implementing legislation that achieves our goals will promote women’s equity, the health and well-being of Nevadans, improve our workforce, and create an environment more favorable to women and working families. Pay Equity – Nevada is 11th in the nation, with women, in general, earning 84 percent of what men earn. Women of color earn 69 percent; 54 percent of what white men earn. Twenty-seven percent of women-headed families live below the poverty level. Promoting pay equity encourages more women to work, supports women and families, and improves the environment for businesses in our state. Paid Sick Days –A paid sick days policy would ensure that Nevadans can care for their own and their family’s health without risking their economic stability. In Nevada, almost half of all private-sector workers do not have access to paid time off when sick. Minimum Wage Increase – Nevada is 28th in the nation at $8.25 per hour. A living wage for a single adult is $10.94 per hour. Increasing the state minimum wage would result in fewer Nevadans living in poverty. Affordable Family Planning – Nevada is 38th in the nation. Affordable family planning will reduce our Medicaid expenses on unplanned pregnancies and reduce the abortion rate. Funding for CHIP & Medicaid – Nevada is 33rd in the nation for CHIP funding and 35th for Medicaid funding. Providing more funds for CHIP and Medicaid would lead to fewer people having to make medical decisions based on their finances instead of the guidance of their doctors. Affordable Childcare – One year of childcare costs more than a year of tuition at UNR. Infant care costs 18.3 percent of the median income. Helping families pay for childcare would make it easier for women to have careers and care for their families. Anti-Sexual Harassment Policy – Nevada does not have a formal policy requiring employers to have anti-sexual harassment training or policies. Policies that promote harassment-free workplaces also help improve employee morale and productivity. Reproductive Freedom – Nevada codified the right to abortion in 1990, yet many laws on the books still contain antiquated language. In addition, Nevada is 38th in the nation when it comes to affordable family planning. Affordable family planning will reduce our Medicaid expenses on unplanned pregnancies and reduce the abortion rate. Nevada Women’s Lobby, AAUW Nevada, Make It Work Nevada, NAACP Reno-Sparks, NARAL Pro-Choice Nevada, Nevada Advocates for Planned Parenthood Affiliates, PLAN Action Fund, and Women of Washoe (WOW). Paid for by the Nevada Coalition for Women’s Equity. Not in coordination with any candidate or campaign.